Look at this photo... 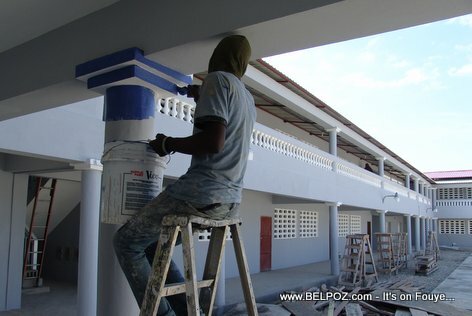 The new Lycee Charlemagne Peralte de Hinche is getting a fresh new paint job. This new high school sit right outside the city, right outside the Hinquitte river for those who knows ville de Hinche. This photo was taken on May 25, 2014 while some painters were putting layer of paint on the high school walls to get it ready to provide education for the children of Hinche and its surroundings. Back to school Haiti 2018 - Are Haitian parents ready financially?